Based on the authors’ more than 70 combined years of professional success working with children of all abilities, “Growing an In-Sync Child” provides parents, teachers and other professionals with the tools to give every child a head start and a leg up. Sensory-motor, perceptual-motor, and visual skills lay the foundation for early motor development. Because early motor development is one of the most important factors in a child’s physical, emotional, academic, and overall success, the “In-Sync Program” of 60 adaptable, easy and fun activities will enhance your child’s development, in just minutes a day. 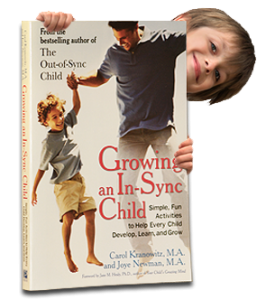 Growing an In-Sync Child was coauthored by Carol Kranowitz; her website is out-of-sync-child.com. Read Reviews Look Inside Table of Contents Buy the Book!